This is my first English post in a long while, I hope I am not too rusty. There is, however, a slight problem with how this gets expanded when it comes to using std::unique_ptr to guard lifetime of types requiring a custom deleter. Very often the resource held has its own deallocation function, be it fclose for FILE, FreeLibrary for WinAPI’s HMODULE, or something else entirely. Remarks: If is_­pointer_­v<deleter_­type> is true or is_­default_­constructible_­v<deleter_­type> is false, this constructor shall not participate in overload resolution. In many cases, this characteristic makes std::unique_ptr with function pointer deleter unusable in containers: an std::array‘s elements must all be fully initialized, std::vector‘s resize() is unavailable, and so is std::map‘s operator. The explanation for this behaviour should be fairly obvious: after all, the function pointer is additional state and – in theory – it could be anything. That being said, the 2× ratio is not defined, although it is a safe assumption on any modern architecture I can think of. Can you guess what the values highlighted to yellow are? Well, at this point I don’t expect there’s much guessing going on. You’re right, they’re all addresses of fclose – 0x408a30. Quite redundant. While I don’t think there’s a noticeable difference in performance speed-wise, at least as long as the size of such an array is small enough, there’s clearly a pessimization of space efficiency. Doubling the size of a pointer is in many cases a deal breaker, as it could cause even larger problems if placed within a structure next to members with high alignment requirements. In my opinion, had the doubling of size been a true necessity, it would be an understandable reason to steer away from std::unique_ptr, especially on memory-constrained architectures. Furthermore, any compiler worth its salt will use empty base optimization to ensure that the size of std::unique_ptr with a stateless deleter is exactly that of a pointer. This is especially unlikely to be untrue, since the standard library uses a stateless std::default_delete to call delete and delete. The following assertion holds true on all platforms and compilers available to me2. Nothing exotic has been tested, though. Finally, there’s no need to provide the secondary argument to the std::unique_ptr‘s constructor – the deleter is default-constructible. 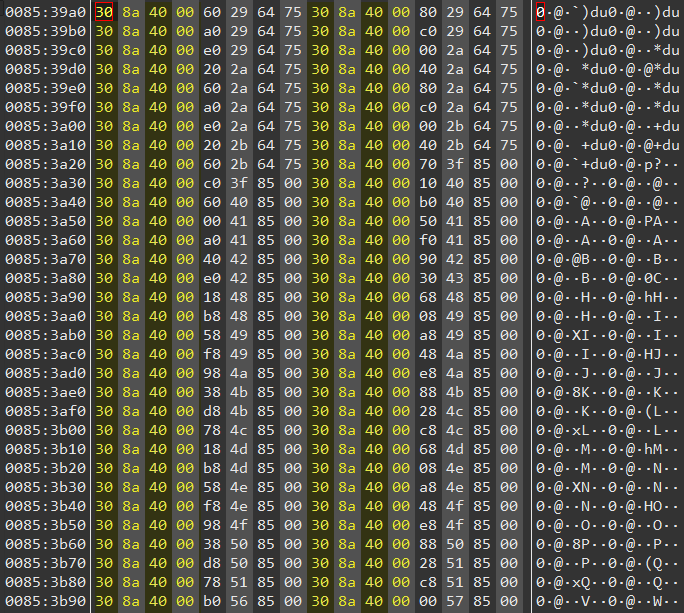 The values highlighted yellow are addresses of fclose, in this run 0x408a18. Yes, there are none; that’s the point. In this battle of good vs. evil, evil definitely comes off worse. Since this is virtually equivalent to the above example of good, I will not insert duplicates of the same snippets. That being said, it stops being that pretty when an overload needs to be selected. What if I actually need state? If you do, then you do. I’m not saying don’t use stateful deleters. Instead, I am saying that you should only use stateful deleters if you need that state, which is obviously not true for all the examples I’ve presented. In any case, if you’re going to create a stateful deleter, consider making it default-constructible, to prevent problems described above. std::unique_ptr is a great and versatile tool, well-deserving its ubiquity. Unfortunately, some internet advice regarding its more advanced usage is, at best, questionable. I hope that this post will be found helpful, especially to those disheartened by apparent deficiencies of custom deleters. 1Along with std::vector, but this is not pertinent to this post. 2Windows x86 (MinGW gcc 5.3.2), x86_64 (MSVC 13), Arch Linux x86_64 (gcc 7.1.1 and clang 4.0) andArch Linux ARMv7 on my Raspberry Pi 3 (32 bit, gcc 7.1.1 and clang 4.0). What if i wanted to use std::function as a deleter ? Thanks :) It seems my default WordPress doesn’t like < and > much (I just used &lt​; and &gt​; to display them), I’ll have to fix that. To answer your question: if you actually need a std::function/stateful deleter, then you should use it. Your example doesn’t convince me that you do, but it may be overly simplified. std::function carries its own size and performance penalties (I’d suggest benchmarking first), but other than that might be a fine choice. You’d still need to supply the deleter constructor argument everywhere, but at least you’d get a default-constructible unique_ptr. Any thoughts on specializing std::default_deleter for FILE instead? As far as I know, this is not a legal specialization point, so it’s not possible. It also feels like a global solution to a local problem. © 2019 /dev/krzaq | Theme: Storto by CrestaProject WordPress Themes. Modified by KrzaQ. | 7 queries, 0.501 seconds.